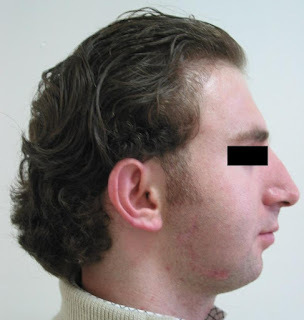 Retrognathia is a condition in which one of the upper and lower jaw is behind the other one and the distance between them is increased than normal. It is the type of malocclusion. Malocclusion is the condition in which there is abnormal alignment of the teeth due to the abnormal positioning of the jaws. Retrognathism is another term used for retrognathia. It is further categorized on the basis of which jaw is misaligned. Maxilla and mandible are the two main parts on which a jaw depends. Maxilla depends upon two bones which merge at the roof and forms the upper jaw line. Mandible is horse shoe type and forms the lower jaw and these both jaws holds teeth on their place. Mandible is more susceptible to be effected by retrognathia as compare to maxilla. And the condition in which the upper mandibular jaw is effected is known as mandibular retrognathia. In mandibular retrognathia the upper jaw is far behind the lower jaw line. Mandibular retrognathia also known as overbite. Overbite is given to mandibular retrognathia because the maxilla overlaps or covers the mandibular jaw line but the mandible jaw is not too far behind the lower maxillary jaw line. Retrognathia may be transferred genetically to the offspring. Genetics may be the cause. Any kind of accidental injury may cause retrognathia. Trauma may also be the cause to retrognathia, especially when there is no recovery seen after the trauma. Trauma can be the major cause of retrognathia because the teeth of infant is in growing stage and once they deformed then the jaw will remain as it is. Infections may also be the cause of retrognathia if the infection is not treated on time. Oral surgery due to cancerous cell in mouth can also cause retrognathia. Retrognathia is not a dangerous condition that can affect the other parts. Patients with retrognathia can suffer from difficulty in eating. There may be problems in posing or taking good care of dental hygiene. The facial appearance also changed due to the misalignment of the jaw lines. Patient may suffer from difficulty in talking, also pauses in breathing, gasping, daytime sleepiness and chocking. The patient may not feel taking part actively in the activities. Sleep apnea may occur due to open mouth during sleep and tongue shifting back to airway. The mouth may remain open all the time. As in mandibular retrognathia the lower jaw bites the palate and there may be an injury. The patient should consult orthodontist for the application of braces for the correction of jaw deformity. 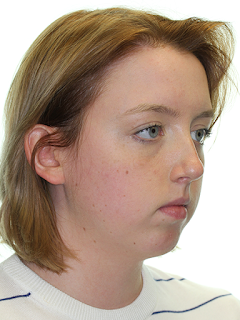 Due to application of braces the patient can achieve the better position of the upper and lower jaw lines. Some patients also prefer dental surgery instead of braces. The dental surgeons and specialist counsel the patient to have good oral hygiene in order to avoid retrognathia in future. Some patients who actively take part in sports wear headgear to avoid retrognathia. Patient should visit doctor regularly for recovery.